When I was a teenager, I used to stay around my grandparents' house a lot over the school holidays, and they would always allow me to use their library card. Whilst exploring the library there, I first discovered Christopher Pike, whose books I would have a love-hate relationship with from that day. I have previously read Weekend, but it has been a while and I wanted to see how it held up. In Weekend we follow a group of friends who are spending their last days before graduation on holiday in Mexico. But what should be a dream holiday is made tense by memories of an unexplained accident that left one of their party severely ill. These tensions are ramped up as things go wrong one by one, starting with the phone lines going dead. I'd forgotten just how 80s this novel feels at times. These days you'd have to write in why no-one is using a mobile phone for one thing. But mainly, the characters feel very reminiscent of the kind of teenagers that you got in films from that generation, both in teen dramas and slasher films. None of them are really all that likeable, but they're entertaining enough that you want them to stay alive. While that can be really cheesy here, it does feel kind of comfortable. Like nothing new has been made here, but the stuff that does come up is handled at least competently. After the irritation that was The Benson Murder Case, I think I needed a bit of comfort reading. Admittedly, I'm not sure why Weekend is labelled as horror, considering that it only barely flirts with the genre in the most minimal way possible. 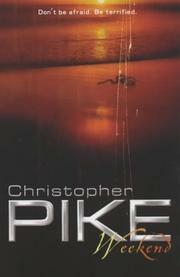 And of Christopher Pike's work, it is also one of the least scary. If you start reading it expecting scares, then you'd be disappointed. If you're looking for a pretty decent thriller and mystery, then you're probably on safer territory.